So hard to believe that May is almost over! Time to refill the basket with some new read alouds, I think. We have been reading, reading, and reading. I posted about a few of the picture books we have read earlier this month. But I have a few more to share that we really enjoyed. 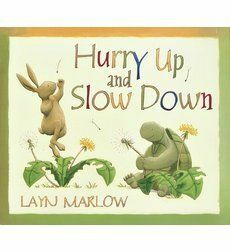 Hurry Up and Slow Down (Layn Marlow) is about two very different friends: Hare and Tortoise. As you might imagine Hare does everything fast and Tortoise does everything slowly. Tortoise likes to wake up slowly, eat his lunch slowly, and even plays games slowly. Hare is always telling Tortoise to “Hurry Up!” Until bedtime, that is. Tortoise just wants a nice cup of chamomile tea in a bit of peace and quiet. Hare wants a story. Just one. Because you’re so good at reading, Tortoise. Before Hare knows it, the book is over. “Hurry up and slow down!” Hare, busy Hare, thinks you need to take time to read a book and look at all the pictures. My book loving kiddos loved this one. I think they might have related a bit with the character of Hare. 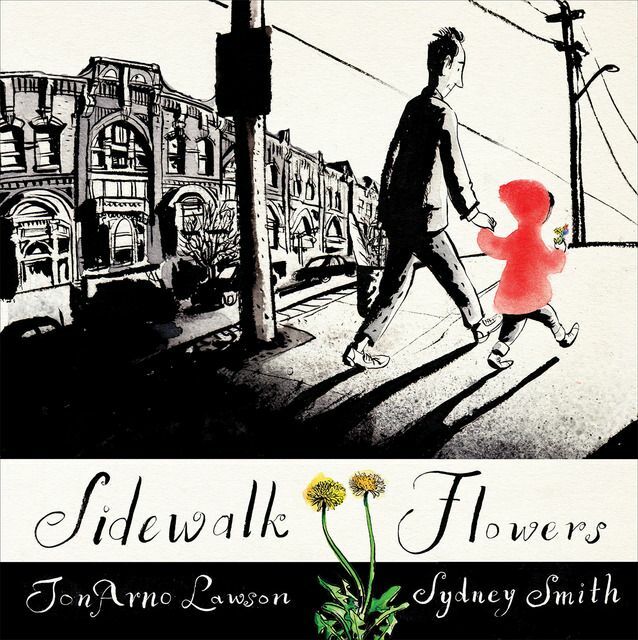 Sidewalk Flowers (Jon Arno Lawson * Sydney Smith) is a wordless book. I am stretching myself by bringing home a wordless book now and then. They are not my favorites but I must admit that I enjoyed this one. A young girl is walking through the city, apparently returning home after a bit of shopping with her dad. As she walks she is collecting flowers. A few growing beside a post or in a crack in the sidewalk. After she has a lovely collection, she begins to share her colorful bouquet. A few placed on a dead bird, a few shared with a gentleman asleep on a park bench, and finally at home she shares with her mom and siblings. The illustrations begin mostly black and white with just the girl’s red jacket and flowers being the splashes of color. But by the end of the book, the pages are full of color as the girl has shared her flower treasure. A very simple but lovely tale told in picture. My nine year old looked at this often and told my younger ones various stories. This is one wordless picture book that I could see us enjoying again. 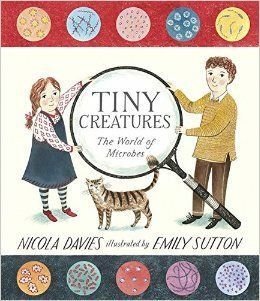 Tiny Creatures: The World of Microbes (Nicola Davies * Emily Sutton) was not what I normally put in the book basket. But as I am stretching myself by reading non-fiction, I wanted to do the same for my younger ones. Science can be a beautiful thing and I did not appreciate that until recent years. Tiny Creatures shares and teaches about microbes in an engaging and understandable way for young learners. Comparing the number of microbes in a drop of seawater to the number of people in New York City help to visualize how small these interesting microbes are. One of mine was not impressed to learn that these tiny creatures lived inside her! Another found that fascinating. Colorful illustrations that help children see the role of microbes was excellent. This was a favorite of my 5 year old son and 9 year old daughter. I definitely recommend this if you need a few books on your science shelf. And there were more but I can’t blog them all, right? For our Family Read Aloud, we finished reading Rascal by Sterling North earlier this month. It is one that my children will probably list as a favorite. We are reading Boys of Blur by N. D. Wilson..I had planned to read it on my own and then pass it around. One evening, I was caught without a read aloud! I grabbed it and there was no turning back. More thoughts to come when we finish it. Tomorrow we have plans to relax at the library. I wonder what we will find? This entry was posted in Book Reviews, Books, Preschool, Read alouds and tagged Books, literature, preschool, reading, review, science by sweetie. Bookmark the permalink.